The rapper had been scheduled to perform at Spark Arena in Auckland, New Zealand, on Thursday (28Sep17), followed by two dates in New South Wales and Queensland, Australia, on 30 September and 1 October respectively. However, following the passing of audio engineer Seth Firkins, Future, real name Nayvadius DeMun Wilburn, has pulled the plug on his remaining gigs Down Under so he can return home to the United States for Firkins' funeral. 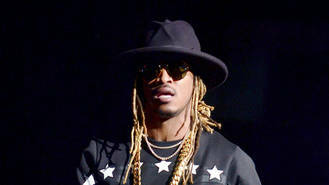 "We regret to advise that a very close friend of Future's has passed away, as a result he is rushing back to the USA to attend the funeral," Live Nation said in a statement. Offering fans a refund on any tickets purchased for the cancelled shows, the tour promoter added, "Live Nation wish to offer Future their condolences at this difficult time and we know his fans will too." Firkins, who was famous for engineering songs for stars including Future, Rihanna, Young Thug, Ciara and Gucci Mane, died in his sleep on Saturday (23Sep17). Future took to Instagram to pay tribute to his friend, sharing a picture of himself in the studio with Firkins along with the caption, "I always gave racism a cold shoulder because my real brother Is a white guy by the name of Seth Firkins. I got a call saying u died in your sleep? First thing came to my mind is, why are you sleep at 5am? That's when we record our best s**t & I tell u "don't" fall asleep we got more work to do.. but somethin told me I should've been at home recording for some reason. "I was saying this in my head, then bad news beat me home! I love u beyond this post, I will cherish u forever big bro, I just wish u would've text me & told me u was going to sleep and i wasn't going to be able to wake u up this time...the family will miss u 1000 per cent!! No kap in my game kid, rest well my brother. Rest well." Future's next gig is scheduled for 10 October in Trondheim, Norway. It remains to be seen whether that tour date goes ahead.